A slowly moving forward aerial winter view of a typical Western Pennsylvania rust belt residential neighborhood in a snowstorm. A slowly moving forward aerial snowing winter view of a typical Western Pennsylvania residential neighborhood. A slowly moving forward aerial winter view of a typical Western Pennsylvania residential neighborhood. 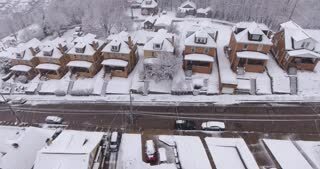 A slowly moving backwards aerial winter view of a typical Western Pennsylvania residential neighborhood during a snowstorm. A slowly moving forward aerial view of a typical western Pennsylvania residential neighborhood corner. 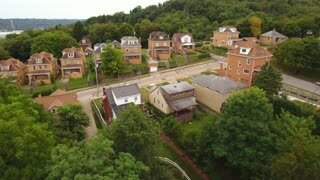 A slowly moving dolly forward aerial establishing shot of a typical Western Pennsylvania residential neighborhood in the late summer. Pittsburgh suburbs.